THE STORY of the New York School of poets is a study in friendship, artistic collaboration, and the bliss of being alive and young at a moment of maximum creative ferment. It is also the story of the last authentic avant-garde movement that we have had in American poetry. You can read Paul Hoover’s review of this book in Jacket # 6. WHEN JOHN ASHBERY, Kenneth Koch, Frank O’Hara, and James Schuyler (pronounced “SKY-luh”) first lived in New York, the Korean War was in progress and McCarthyism was the scourge of freethinking intellectuals. It was the era of Levittown* and the “silent generation” when the original Guys and Dolls was on Broadway, suburban flight was in progress, New York had three baseball teams and at least one of them played in the World Series every year. In an age of split-level conformism, the poets of the New York School put their trust in the idea of an artistic vanguard that could sanction their deviations from the norm. The liberating effect of their writing became increasingly evident in the passionate, experimental, taboo-breaking early 1960s, when the nation’s youngest president was in office, men discarded their hats, women started using the Pill, the acceleration in the speed of social change seemed to double overnight, and America finally left the nineteenth century behind. Substitute Frank O’Hara for Apollinaire and Abstract Expressionism for Cubism, and you get an eerie fit. The poets of the New York School were as heterodox, as belligerent toward the literary establishment and as loyal to each other, as their Parisian predecessors had been. The 1950s and early ’60s in New York were their banquet years. It is as though they translated the avant-garde idiom of “perpetual collaboration” from the argot of turn-of-the-century Paris to the rough-hewn vernacular of the American metropolis at mid-century. The poets took their lead from the Abstract Expressionists (also known as the Action Painters and as the New York School of painting) in several key respects. From Jackson Pollock and Willem de Kooning, they learned that it was okay for a poem to chronicle the history of its own making — that the mind of the poet, rather than the world, could be the true subject of the poem — and that it was possible for a poem to be (or to perform) a statement without making a statement. From the painters, too, they understood that acceptance was not necessarily a blessing, nor rejection a curse. “The literary establishment cared as much for our work as the Frick cared for Pollock and de Kooning,” O’Hara wrote defiantly, pushing the analogy between poets and painters. Like painting, writing was properly understood to be an activity, a present-tense process, and the residue of that activity could not help referring to itself. All poetry was the product of a collaboration with language. While mimesis, the imitation of nature, remained a goal of art, the abstract painters had redefined the concept by enlarging the meaning of nature; “I am nature,” Pollock said. This, too, was a liberty the poets could take. Like abstract paintings, their poems originated not in a Platonic conception of their final form but in an engagement with the medium of expression itself. THE POETS liked hoaxes and spoofs, parodies and strange juxtapositions, pseudotranslations and collages. On the ground that the rules of all verse forms are at base arbitrary, they created ad hoc forms (requiring, say, an anagram or the name of a river in every line) and unconventional self-assignments (“translate a poem from a language you do not understand; do not use a glossary or dictionary”). They adapted the Cubist collage and the Surrealist “exquisite corpse” (a one-line poem composed by a group of poets, each of whom contributes a word without knowing what the others have written). Apollinaire’s café poems, “Les Fenêtres” and “Lundi rue Christine,” taught them that a poem could originate in snatches of overheard conversations. You could cull lines at random from books. Or you could scramble the lines in an already written poem to produce a disjunctive jolt. Many works would be improved if you simply deleted every second word. Poems didn’t have to make sense in a conventional way; they could discover their sense as they went along. The logic of a dream or a word game was as valid as that of empirical science as a means of arriving at poetic knowledge. Freely experimental and fiercely intellectual, the poets were at the same time resolutely anti-academic and anti-establishment even as they began to win acceptance in establishment circles. ALL THIS ACTIVITY was predicated on the idea that poetry could be reinvented from top to toe. Everything was up for grabs. “It came to me that all this time / There had been no real poetry and that it needed to be invented,” Koch writes in “Days and Nights,” one of several of his poems that look back to the seminal 1950s. The approved American poetry of the time was crusty with convention. “There was no modern poetry in the sense that there was modern painting,” Ashbery asserted. The avant-garde writer had the advantage of beginning with a clean slate (or the illusion of one). The rejection of the acceptable poetry of the age made it possible to pursue a grander ambition: “to write poetry that is better than poetry,” in Koch’s words. It is not that Ashbery, Koch, O’Hara, and Schuyler were ignorant of poetic tradition. On the contrary, they were voracious readers. But they recognized that tradition is a vast passing-away and renewal, and they had enough respect for the past not to copy it lazily but to adapt, alter, and adjust the tradition through the application of their individual talents. They understood, too, that a poem no less than a picture could be “a hoard of destructions,” in Picasso’s phrase. And so they favored avant-garde methods of composition that inverted the received order of things. The aim was the liberation of the imagination, and any and all means to this end were valid. 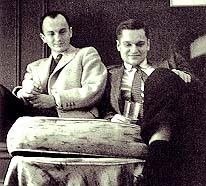 Detail: Frank O’Hara and James Schuyler, Southhampton, 1956. Photo copyright © John Button, 1956. Forty years after Pound and Eliot made the first modernist revolution in poetry, the New York poets were the first to extend that new frontier. They were intent on widening the framework of American poetry; they wanted to be read not in the narrow context of the Anglo-American poetry of mid-century but with reference to other arts, earlier periods, alternative traditions. The poets were unusually responsive to modern music and to poetry in other languages as well as to modern art. 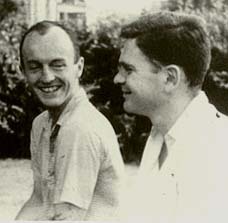 They favored a tradition of literary outsiders — what Ashbery has called “an other tradition” — and felt that, in Ashbery’s words, “modern poetry gave the poet the license to be strange.” They admired the deliberate “derangements” of Arthur Rimbaud, the artificial contrivances of Raymond Roussel, the peripatetic musings of Guillaume Apollinaire; they learned from the expatriate experiments of Gertrude Stein and Laura Riding as well as from such neglected homespun originals as David Schubert, Delmore Schwartz, and John Wheelwright. French poetry since Baudelaire and the Symbolists put it through the paces of the modernist revolution had a particularly salubrious effect on the New York poets. By adopting unconventional methods and models, they were able to reject the academic orthodoxies of the New Criticism, then the dominant mode of literary interpretation, which seemed to have a stranglehold on mid-century verse. Enlarging the sphere of the poetic, they revitalized poetry at a moment when it seemed that everything that could be done had been done. (It always seems that way.) They took Pound’s old dictum to heart: They made it new. 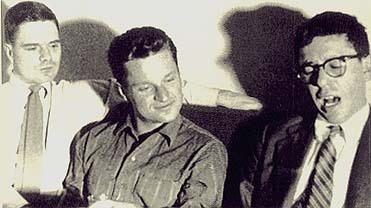 THE NEW YORK SCHOOL of poets — though it wouldn’t be named that until 1961 — can be said to have begun operations on the June day in 1948 that Ashbery, completing his junior year at Harvard, wrote “The Painter” and mailed it to Koch, who had already graduated from Harvard and migrated to New York. “The Painter,” a sestina, was the first of many poems in which these poets aligned themselves with modern painters in their crises, their conflicts, and their sense of artistic aspiration and romantic possibility. A pretty good idea of the aesthetics of the New York School could be gleaned from such works as Koch’s “The Artist,” Ashbery’s “The Painter” and “Self-Portrait in a Convex Mirror,” and O’Hara’s “Memorial Day 1950” and “Why I Am Not a Painter,” all of which treat the visual arts as a kind of allegorical surrogate for poetry. It seems both just and inevitable that Ashbery, O’Hara, Koch, and Schuyler gave their first public readings at the Club, the nondescript Eighth Street loft where the Abstract Expressionists gathered weekly to hash out aesthetic issues. 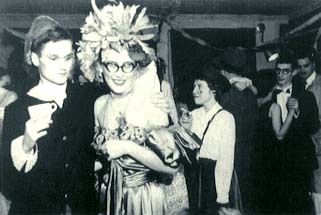 The poet at the vital center of the New York School was O’Hara. The group did not gel, Ashbery observed, until O’Hara arrived in New York in 1951 “to kind of cobble everything together and tell us what we and they were doing.” O’Hara, who did much to promote the Abstract Expressionists in his curatorial position at the Museum of Modern Art, was also the nearest thing to an action painter in verse. Blessed with tremendous personal magnetism, O’Hara lived the life of a poet in New York, and chronicled it. The painters adored him; Philip Guston called him “our Apollinaire.” O’Hara’s death in a freak accident on Fire Island in July 1966 removed the group’s dominant personality. But by then the New York School had established a sphere of influence beyond its initial milieu. 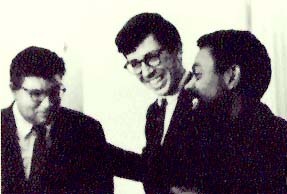 That influence has ramified over the years, and today the impulses and strategies of the school have less to do with the specific geography of New York than with a state of mind in which the capacity for wonderment is matched by the conviction that poems are linguistic engines rather than repositories of felt experience. In contrast to their painter namesakes, the New York School of poets did not quite conquer the world of poetry; the recognition they won came grudgingly and belatedly. Koch was the first to achieve a national reputation. His innovative techniques for teaching poetry to schoolchildren — as described in Wishes, Lies, and Dreams (1970) and Rose, Where Did You Get That Red? (1973) — made him the most famous poetry teacher in America. O’Hara’s posthumous apotheosis came in 1972, when his Collected Poems won the National Book Award in poetry. Ashbery, though a darling of the international avant-garde, was still a well-kept secret until 1976, the year his Self-Portrait in a Convex Mirror was the dark horse that won the Triple Crown — the Pulitzer Prize, the National Book Award, and the National Book Critics Circle Prize. Overnight Ashbery became an inescapable presence in American poetry, provoking seminars, debates, essays in criticism, a fair amount of attention in the national press, more prizes and honors, a great many imitators, and a slew of never-say-die critics bent on denigrating their favorite bête noir. Schuyler, the last of the four core members of the New York School to come to prominence, did so when his Morning of the Poem won the Pulitzer in 1980, due in part to the efforts of Ashbery, who was one of the judges that year. What makes the New York poets exemplary at this time is that they managed to be not only avant-garde writers but literary artists. They experimented not for experimentation’s sake but for the sake of writing great poems. Their idea of innovation was very different from a value placed on novelty. They wanted to be original in the sense recommended by Emerson: “Why should not we also enjoy an original relation to the universe?” While they could be silly, they were artful in their silliness; they used playful means to arrive at high aesthetic ends. They formed a movement not by design but by a kind of group momentum fostered by friendship and propelled by their growing confidence in the value of their works. Eventually it would be seen that the poems they wrote and the magazines they edited had casually performed the task of manifestos and pronouncements. Without searching for them, the poets attracted apostles, who understood that their works implied a collective point of view and a finely honed sense of taste embodying that point of view. It was not the most heralded movement of the 1950s; the Beats made more noise. But it will have the most lasting significance. “THE LAST AVANT-GARDE” aspires to combine cultural history, biography, and literary analysis. In the first half of the book, I profile Ashbery, O’Hara, Koch, and Schuyler singly and as a group. I mean to show that this remarkable gang of four, though different from one another in ways that I will make clear, should be considered in the light of what they shared. Contemporary critics tend to treat Ashbery as an isolated case. Without wishing to diminish Ashbery’s great singularity, I believe that the spirit of collaboration and the sense of common cause linking these poets are too important to be minimized or ignored. I also want to communicate what Lionel Trilling called the “hum and buzz of cultural implication” in New York during the group’s glory years — the years between the Marshall Plan and the escalation of the war in Vietnam. What was it like to start out in the early 1950s? Though received wisdom has it that the decade was a dead zone, the period was in fact a major moment for the imagination, an exciting episode in the cultural history of New York City, and it wasn’t all that long ago, though it seems nostalgically far away: a time when the life of the artist had a certain seedy glamour, rents were cheap, the subway safe, and the art market had not yet become the plaything of the very rich. Hoping to convey the aura of the era, I will interrupt my narrative as needed to introduce the reader not only to painters, critics, and gallery directors but to other totemic figures who turn up because they populated the literary landscape (W. H. Auden, Robert Lowell, Jack Kerouac, Allen Ginsberg), because they helped define the intellectual currents of the time (Clement Greenberg, Lionel Trilling, Susan Sontag, Norman Mailer), or simply because Frank O’Hara wrote about them in his poems (Jackson Pollock, Miles Davis, Lana Turner, Billie Holiday, James Dean) as versions of the same American dream that inspired and consumed him. The interval between rejection and acceptance has steadily grown shorter since Stein wrote those words. The consequence is that the avant-garde’s incursions into the temple of art have become ritualized as the predictable gestures of postmodernism. Kafka’s succinct parable “Leopards in the Temple” seems to apply: “Leopards break into the temple and drink up the contents of the sacrificial pitchers; this is repeated again and again; finally it can be calculated in advance, and it becomes part of the ceremony.” If we are all postmodernists, we are none of us avant-garde, for postmodernism is the institutionalization of the avant-garde. In the second half of this book, I raise the question of whether the avant-garde as an abstract concept or a practical idea is finished. It is a question that leads to others, or requires the answer to others, before it can be settled. What does (or did) avant-garde mean, and how did it come to have that meaning.? What exactly are the requirements of an avant-garde art movement? What lessons do the movements of the past have to teach us? The argument against the viability of the avant-garde today rests on the assumption that there is no real resistance to the new, no stable norm from which the defiant artist may depart. While I find this to be a convincing argument, I would sooner help quicken a new avant-garde than pronounce the demise of an old one. In any event, my book means to stand or fall not on speculation regarding the future of the avant-garde but on the job that it does of presenting four major poets, defining their importance, examining the way their friendships entered their art, and depicting the milieu in which they lived and worked. When I lecture on the New York School, I am sometimes asked why relatively few women were involved in the movement. I reply that this is not true of its later manifestations. 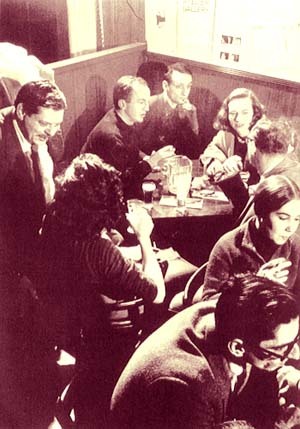 In the 1960s and ’70s, when St. Mark’s Church in the Bowery served as headquarters for a second generation of New York School poets, the leading exponents of the style included Anne Waldman, Bernadette Mayer, Maureen Owen, and Alice Notley no less than Ted Berrigan, Ron Padgett, Joe Brainard, Tony Towle, and Michael Brownstein. Women figure even more prominently on any list of contemporary poets for whom the New York School influence has been decisive. In this way, the demographies of the New York School have accurately reflected a larger sociological pattern. But the predominantly masculine identity of the New York School in its formative years does have a crucial, and crucially ironic, significance. Masculine the poets were, but they deviated boldly from the prevailing idea of masculinity. In their aestheticism, the New York poets presented an alternative to the aggressive heterosexualism of an era whose celebrations of manhood were themselves signs of a high anxiety. “That was the year everybody in the United States was worried about homosexuality,” John Cheever wrote in his journal in 1959. “They were worried about other things, too, but their other anxieties were published, discussed, and ventilated while their anxieties about homosexuality remained in the dark: remained unspoken. Is he? Was he? Did they? Am I? seemed to be at the back of everyone’s mind. A great emphasis, by way of defense, was put upon manliness, athletics, hunting, fishing, and conservative clothing, but the lonely wife wondered, glancingly, about her husband at his hunting camp, and the husband himself wondered with whom he shared a rude bed of pines. Was he? Did he? Had he? Did he want to? Had he ever? But what I really mean to say is that this is laughable. Guilty man may be, but only an absurdly repressed people would behave this way.” Not the least attractive thing about the poets of the New York School is the freedom from guilt that their celebration of the imagination entailed. And while I would not want to over-emphasize their homosexuality as an element of their aesthetic practice, it does seem to me that one question some of these poets are asking some of the time is whether the American pursuit of happiness may be consistent with a poetics of gaiety in both the traditional and modern senses of the word. “The regularity of my design / Forbids all wandering as the worst of sinning,” Lord Byron wrote at the beginning of Don Juan, the most digressive of English poems. My design in The Last Avant-Garde is not nearly as regular as Byron’s but favors some of the same narrative and rhetorical strategies, including digressive sidebars and the abrupt insertion of the first-person point of view. As a poet who came under Koch’s spell at Columbia and later became a colleague of Ashbery’s at Brooklyn College and at Newsweek, I have not hesitated to draw on my own experiences as they relate to the history, the methods, and the personalities of the New York School. I BEGAN writing The Last Avant-Garde in a studio I was renting at the Chelsea, the venerable bohemian hotel on Twenty-third Street in Manhattan, where James Schuyler resided during the last twelve years of his life. When I turned in the manuscript, I was living in a small apartment on MacDougal Street, just a few paces from the old San Remo café, long gone, where Schuyler, Ashbery, O’Hara, and Koch used to initiate evenings with drinks and an exchange of poems. The unmarked site of the Cedar Tavern, the fabled “painters’ bar,” where the poets bent elbows with Franz Kline and Willem de Kooning, was a short walk away on the corner of Eighth Street and University Place. (The current incarnation of the Cedar a few blocks north on University Place bears no relation to the dive of Abstract Expressionist legend.) In the course of researching this book, I frequented other locales dear to the hearts of the New York School of poets: the Museum of Modern Art, where O’Hara (and briefly Schuyler) worked; the New School for Social Research and Columbia University, where Koch quickened the enthusiasm of several generations of New York poets; and the Tibor de Nagy Gallery, now on Fifth Avenue and Fifty-seventh Street, which, at a previous location in the early 1950s, had sponsored the first publications of the New York poets and celebrated their collaborative forays with painters. It is no secret that our own times are inimical to the imagination. Technology has put art to the rout. The concept of fame has been degraded, replaced by the notion of celebrity, and poetry is recognized as an expedient and sometimes eloquent way to hasten the aims of social justice on the one hand and of marketing strategies on the other. Poetry consists of irreproachable sentiment rendered in bite-sized pieces, doggerel for an inaugural. Or it is a rhymed injunction to the jury, or a rock singer’s wail. Or perhaps it is something in the air of a hip, dark underground café that can help sell blue jeans. How precious at such a time is true poetry, which resists the blandishments of the celebrity culture, is impatient with pretense and piety, and remembers that the gratuitousness of a work of art is its grace. If reality is indistinguishable from the consumerism and mass thinking that the mass media foster, there is an urgent need for a poetry that can press back against the pressures of reality, and I would argue that the example of the New York School may best show the way. We are so often told that poetry plays a marginal role in our culture that most of us accept this as a fact without ever considering that its position on the periphery may be what gives American poetry the freedom in which it has flourished. I am convinced not only of the high quality and enduring value of our best poetry but of its importance in helping us to understand some of the major aesthetic and cultural issues of our time. I believe this to be especially true of the New York School, and I hope that the sense of romantic possibility that charged the lives of these poets may prove as inspiring to my readers as it has been in my own life and work. DAVID LEHMAN, author of Signs of the Times: Deconstruction and the Fall of Paul de Man and several books of poetry, is the series editor of The Best American Poetry. You can order David Lehman’s books directly from the Internet. Choose the bookstore closest to you, and select the live link . . . The current issue of Bold Type, an online literary magazine published by Random House, features an excerpt of The Last Avant-Garde, as well as some poems by David Lehman and a brief discussion of his work on the book. Worth a look.